Intel Management Engine Interface (MEI-AMT) Version 12.0.1249 WHQL. 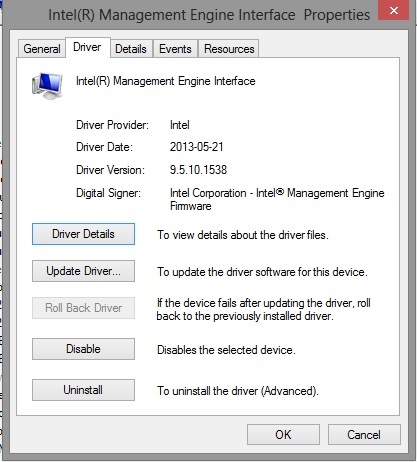 - New pack drivers Intel Management Engine interface from company Intel. Supported chipsets: Intel® Management Engine Firmware (for Intel Z370, X299, Z170, Z270, Q270, B250, H1xx, B150, Z97, X99, H97, Z87, ... (Intel Serie 8/9/100/200) etc... Series Express Chipset Family / PCH platform). Intel H61, B65, HM65, Q65, H67, HM67, P67, UM67, Z68, HM70, B75, HM75, Q75, Z75, HM76, H77, HM77 , UM77, Z77, H81, B85, Q85, Z85, HM86, H87, HM87, Z87, H97, HM97, Z97, X99, Z170, H170, B150, Z270, Q270, B250, X299, Z370, Core M-5Y10, M-Core 5Y10a, M-5Y70 Core, Celeron 3205U, 3755U Celeron, Core i3-5005U, Core i3-5010U, Core i3-5157U, Core i5-5200U, Core i5-5250U, Core i5-5257U, Core i5-5287U, Core i5-5300U, Core i5-5350U, Core i7-5500U, Core i7-5550U, Core i7-5557U, Core i7-5600U, Core i7-5650U or Pentium 3805U.